Are you finding it difficult to water your lawn for hours at a stretch, regularly? Won’t it be fantastic if you can get an automated system that makes your job easier? At H3O Water Systems, we are always looking for ways to make your life easy and more satisfying, with our sprinkler systems in New Braunfels, TX. Over the years, we have introduced the latest innovations in the world of sprinklers, splash pads, spa, and swimming poolfor commercial and residential purposes. You can depend on us for equipment installation, repair, maintenance, and upgrades. We have been servicing San Antonio greater area since 2006. So, what can you expect from our sprinkler systems? This includes an expansive range of related solutions to suit every need and budget. Our aim is to provide highly cost-effective and water efficient systems, so that you can gain optimal benefits with minimal wastage, if any at all! Below is a look at what our team can do for you. No one can deny the superior benefits associated with the installation of new sprinklers at home or at a commercial front. Sprinklers enhance the aesthetic appeal of your lawn, extend the life of plants, and even add to the value of your property. What more could you ask for from your New Braunfels sprinkler systems? We optimize the valuable effects of such practical systems by offering high quality installations that work for you. All kinds of equipment and mechanisms are prone to damage or problems of one kind or another with the passage of time. Naturally, you will need repairs to your sprinkler systems in New Braunfels, Texas from time to time. We offer tailor-made services to fix the wear and tear of your sprinklers. We offer quick repair time and have mobile trucks ready during the service hours. Simply contact our professionals, and they will be on-site immediately; whenever your sprinkler system gives you trouble. Our high-tech equipment ensures quick dealing with buried valves, underground repair, and much more! At H3O Water Systems, we offer regular inspection services of water sprinklers, so that problems can be quickly identified and fixed as well. To ensure a comprehensive examination of the issue, we offer 42 point inspections of the irrigation system, including sprinkler nozzle head adjustments. This guarantees optimal coverage. We render an accurate estimate of the repair work (if needed), to help you get an idea about the expenses. Over the years, we have gained an expansive experience in this field. We offer practical and economical solutions, that guarantee peace of mind. 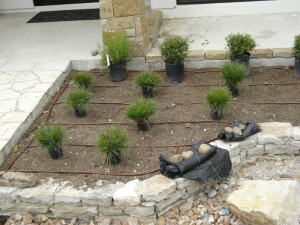 Have questions about the sprinkler system services from H3O Water Systems such as New Braunfels drip irrigation? Please feel free to contact us any time at (210) 836-8181!